By Julie Mayer Hunt, D.C., D.I.C.C.P., F.C.C.J.P. The Craniocervical Junction (CCJ) is the most complex joint region in the body. The CCJ is a collective term that refers to the occiput (posterior skull base), Atlas, Axis and supporting ligaments. It is a transitional zone between a mobile cranium and a relatively rigid spinal column. It encloses the soft tissue of the brainstem at the cervicomedullary junction (medulla, brainstem and spinal cord). It is critical to fully understand the neurology, biomechanics, soft tissue integrity including ligaments(7), blood flow, and cerebral spinal fluid flow at the junction between the brain and the body. (3) Magnetic Resonance Imaging (MRI) of the CCJ provides additional insights to be considered when evaluating care or treatment for this region. Performing imaging in an upright posture compared to recumbent can reveal significantly different parameters. The purpose of this paper is to illustrate observations on CCJ imaging utilizing upright MRI. Chiropractors have always looked to perform upright X-ray imaging to be able to observe functional spinal relationships because gravity affects posture. Weight bearing is essential in understanding spinal functional dynamics. The same applies to Magnetic Resonance Imaging (MRI). Looking at spinal dynamics with respect to disc involvement, when the spine is supine, the disc will be under less gravitational load when compared to standing or seated. (4) Just as you would check the air pressure in car tires while on the ground as compared to on a lift, you want to see weight bearing effects on spinal dynamics functionality. The base of the brain has cerebellar tonsils which in large part are responsible for our balance and coordination. The brain and spinal cord are one unit, think of the spinal cord as a long braided ponytail, it is an extension of the brain. 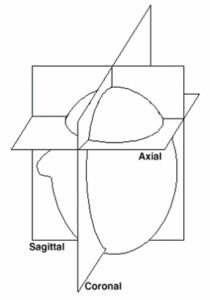 When the base of the skull and the Atlas/Axis become misaligned, the dentate ligaments supporting and protecting the brainstem can potentially produce caudal tension at the skull base creating a downward tug at the brain base. The CCJ is the main circuit breaker neurologically as well as being the “mouth” to the brain for fluid exchange – including both CSF and blood. The CCJ is best imaged upright to observe true functional positioning of key components such as the cerebellar tonsils. When MRI imaging is done in a supine fashion the back of the head can act like something of a “bowl” and the brain tissue tends to slide into the bottom of the bowl. When viewed upright, the brain tissue may occupy a different position. Also spinal misalignments can be observed and pictures are difficult to argue with. Chiari Malformation is a serious neurological disorder where the bottom part of the brain (cerebellar tonsils) descend into the foramen magnum crowding the brainstem/spinal cord altering CSF flow dynamics producing many disabling symptoms. Symptoms can vary greatly from one person to another, and some patients may be asymptomatic until a trauma occurs. (2) The most common symptoms include neck pain, headaches, visual abnormalities, poor coordination, difficulty swallowing, nausea, dizziness, cognitive issues, anxiety and depression. 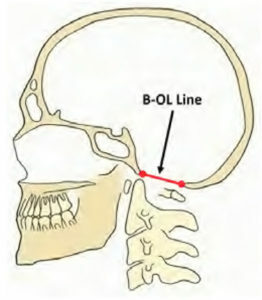 Cerebellar tonsil position is commonly measured using the Basion-Opisthion Line (B-OL), also known as the McRae Line), shown in Figure 1. When the cerebellar tonsils descend five (5) mm or less below the Basion-Opisthion line (skull base) and into the spinal canal, this is referred to as Cerebellar Tonsular Ectopia (CTE), and may be listed as Chiari 0 or borderline Chiari 1 depending on the exact measurement. 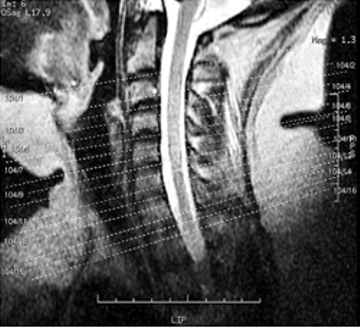 A Chiari 1 is measured as more than five (5) mm descent of the tonsils into the spinal canal. The slice thickness in these cases is 2.8 mm. The axial slices were obtained in proton density (PD) which is best to see ligaments. The sagittal slices were obtained in T1 (longitudinal relaxation time) and T2 (transverse relaxation time). Coronal images were obtained in T1. 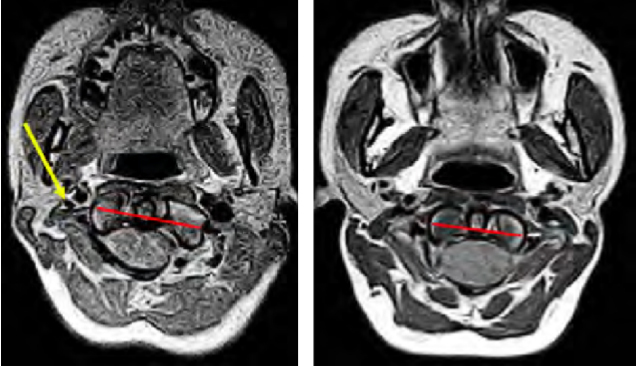 The comparative upright imaging shows increased involvement at the CCJ with respect to cerebellar tonsils, and the patient’s headaches are better lying down and increase in the upright position correlating with tonsillar position. Most patients with headaches report that lying down is better than upright when they are known to have Chiari malformations. In 2012, the Glymphatic system was postulated (10) with regards to lymphatic drainage and brain health. The Lymphatic system that was discovered in the brain is dependent on CSF flow. The CSF flow, when obstructed, appears to have negative plausible effects on brain health. Therefore having the CCJ aligned contributes to non-obstructed flow of CSF and should contribute to improved brain health. Trauma continues to be a major player in the disruption of the CCJ integrity. Falls, motor vehicle crashes, sports injuries and other traumas affecting the head and neck relationship throughout our lives play into the ability of the CCJ to facilitate the brain/body connection. All patients deserve an appropriate evaluation of the CCJ for optimal brain health parameters and brain/body for our health. There is much more that needs to be studied and understood to optimize brain health. The upright MRI imaging is a platform that potentially could allow Neurology, Neuroradiology and other medical specialties to work together with board certified Chiropractic CCJ procedure specialists to benefit patients and families. Understanding the complexities of the CCJ should compel all health practitioners to study further and understand how to optimize the function of the most complex joint region of the body. The author wishes to extend sincere appreciation to Dr. Scott Rosa, D.C., B.C.A.O., Rock Hill, NY, a pioneer in advanced imaging of the CCJ for his mentoring and the opportunities to participate in observing CCJ imaging at the Capital Upright Imaging Center, Latham, NY. Additionally, Dr. Richard Leverone, DC, DACBR has provided invaluable insights into CCJ MRI imaging interpretation. Julie Mayer Hunt, D.C., D.I.C.C.P., F.C.C.J.P., is a second generation upper cervical care chiropractor. After graduating from Life University in 1981 she started practicing with her father, Dr David Mayer at Mayer Chiropractic Clinic in Clearwater, Florida. Her son, Travis, joined the practice two years ago after graduating from PCC-Florida. In 2000, Dr. Hunt completed her Diplomate in Clinical Chiropractic Pediatrics and began presenting seminars in upper cervical pediatrics across North America for many state organizations. She has published several papers in peer-reviewed journals and contributed chapters on upper cervical procedures to two textbooks. Very active in the chiropractic community. 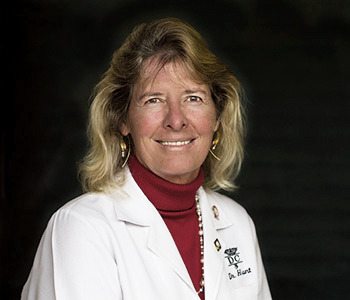 Dr. Hunt serves on the Florida Chiropractic State Board, is President for the Society of Orthospinology, Founding member and Secretary for the ICA Council on Upper Cervical Care, and the co-chair of the Curriculum Committee for the Diplomate in Chiropractic Craniocervical Junction Procedures (DCCJP). She received her Fellowship in Chiropractic Craniocervical Junction Procedures (FCCJP) in 2015. Dr Hunt is a Distinguished Fellow of the ICA, has received many awards and named ICA’s Chiropractor of the Year in 2014 and the ICA’s Council of Upper Cervical Care’s Upper Cervical Chiropractor of the Year in 2016. 1. Rosa, S., Baird J.W. ; The Craniocervical Junction: Observations regarding the Relationship between Misalignment, Obstruction of Cerebrospinal Fluid Flow, Cerebellar Tonsillar Ectopia, and Image-Guided Correction; The Craniocervical Syndrome, Smith, F.W. and Dworkin, J.S Editors; Karger; 2015; pages 48-66. 2. Flanagan, M.F. ; The Role of the Craniocervical Junction in Craniospinal Hydrodynamics and Neurodegenerative Conditions; Neurology Research International, Volume 2015, Article ID 794829, 2015. 3. Freeman, M.D., Rosa, S., Harshfield, D., et al. ; A case-control study of cerebellar tonsillar ectopia (Chiari) and head/neck trauma (whiplash); Brain Injury; July 2010; 24(7-8): 988-994. 4. Smith, F.W. ; Upright MRI in the study of the Cranio-cervical junction; presentation at the International Hydrocephalus Imaging Work Group Spring 2013 Conference; 2013. 5. Parizel, P.M., van den Hauwe, L., et al. ; Magnetic Resonance Imaging of the Brain; Clinical MR Imaging, P.Reimer et al. (eds. ); Springer-Verlag; 2010. 6. Riacos, R., Bonfante, E., et al. ; Imaging of Atlanto-Occipital and Atlantoaxial Traumatic Injuries: What the Radiologist Needs to Know; RadioGraphics 2015; 35:2121-2134; 2015. 7. Kahn, A.N (Chief Editor), et al. ; Upper Cervical Spine Trauma Imaging; Medscape; Online Article 397563; 2015. 8. Grostic, J.D. ; Dentate Ligament – cord distortion hypothesis; Chiropractic Research Journal, vol. 1, no. 1, pp 47-55, 1988. 9. Eriksen, K.; Upper Cervical Subluxation Complex: a Review of the Chiropractic and Medical Literature; Lippincott Williams & Wilkins, 2003. 10. Iliff, J.F, et al. ; A Paravascular Pathway Facilitates CSF Flow Through the Brain Parenchyma and the Clearance of Interstitial Solutes, Including Amyloid β; Science Translational Medicine; 15 Aug 2012:Vol. 4, Issue 147, pp. 147.